Unlike the previous Crysis entries, you don’t start off in the famous Nanosuit or the elite government agency that uses them. You play a marine named Alcatraz who is being shipped out to New York for a mission that you’re not fully briefed on. En route, you're attacked and the submarine you’re on is sunk by aliens. Barely surviving, you are pulled out of the water by Prophet, the main character from previous Crysis games. It's not long before he gives you his Nanosuit; it’s the only thing that can keep you alive in this new urban battlefield. Like many games, you start off with a quick tutorial showing you how to crouch, sprint and jump. You’ll also learn about the Nanosuit's capabilities, including the ability to cloak, use heat vision and activate an armor mode. There’s also a tactical visor that can show you the locations of objectives and the closest ammunition stashes. I’m happy to report that the ammo stashes are plentiful in Crysis 2. My biggest complaint in the original Crysis games is that there was never enough ammo. Grenades are a little harder to come by, so I usually stock up on them. Besides grenades, you can have some fun with C4 explosives, guided missiles and machine guns. Some shotguns and sniper rifles are thrown into the mix as well. You can customize your weapons to use laser sights and suppressors/silencers. When you kill aliens you earn points to upgrade your Nanosuit even further. You can learn new attack moves and abilities like enemy tracking. Strong Points: Beautiful graphics; engrossing story and cut scenes. Weak Points: No offline LAN or stand alone dedicated server package; if you want to play this game online you have to play on rented servers. Moral Warnings: Lots of swearing and blaspheming; every swear word imaginable is used; violence is a given and there’s plenty of human and alien blood and guts to be seen. You’ll have plenty of enemies in this game. In fact, you start off the game with both humans and aliens firing at you. The marines are after a Dr. Gould, the only one who has the answers regarding your suit and its abilities to decode the alien virus that is killing the population of Manhattan and possibly the world. So instead of trying to kill Dr. Gould, you must find him and bring him the answers he is looking for. Unfortunately, this is easier said than done. Most of the game is a cat-and-mouse chase and every time you get close enough to make contact something gets in the way and you have to meet up with him at another location. While the character development is believable, I miss the camaraderie of being on a tactical team in the previous games. You’re mostly on your own in this game. Fortunately, later in the game, human enemies stop shooting at you and there are some moments when you fight alongside a Marine squad. The AI is top notch and the fights are fast and furious. The fights can get really tough and the odds are never in your favor. The suit is great but the energy on it doesn’t last very long. Energy is what holds your shields up or keeps you cloaked. If you run out of energy your defenses will be down, quickly followed by your health. If the battles are too much for you, you can change your game difficulty on the fly. Saving on the other hand, cannot be done whenever you want. Crysis 2 uses check points and when you die, you’ll be brought back to the last check point. As much as I miss the quick saves, I will admit that the check point system is pretty generous and there are plenty of them. For those gamers who like achievements, there are enough here to satisfy you. There’s a funny achievement for going past red light cameras and getting speeding tickets. The developers have a sense of humor and it shows in some of the Easter eggs put into this game. You can also collect dog tags, souvenirs and car keys to gain access to new vehicles and gear. When you’re done with the single player campaign you can try your hand at multiplayer. Your Nanosuit upgrades and enhancements carry over into the online play. There are ranked and unranked servers so if you care about your character’s progress, only play on ranked servers. The ranked servers keep track of your character's experience earned which unlocks new player classes and gear. Ranked servers can also compare your character stats with other players wold wide. Like many multiplayer games as of late, your character gains levels from experience earned by killing opponents and completing objectives. The upgrades you can get vary on the type of soldier you are. For example if you prefer to snipe, the enhancements you will get include better sniper rifles, scopes, and heat vision to detect cloaked players. If you're sneaky, your available upgrades will improve your stealth, tracking, and cloaking abilities. The online system is managed by Gamespy and there are a lot of servers but only a handful are populated. I bet this is because you can only play on rented game servers and can’t do a LAN game or set up your own server with a dedicated server package. There are various game modes including Assault Mode, Extraction, Team Assault, Capture the Relay and Instant Action. Many of the modes involve capturing or defending objectives while the Instant Action and Assault Modes are just about killing the most enemies. Instant Action mode is the equivalent to death match where you want to have the most kills under your belt before the round is over. The killing is pretty brutal in multiplayer, for example; you can slit your opponents throat and watch all your deaths in slow motion. The maps are all new but still take place in an urban environment. I have played on indoor and outdoor maps and have found them very roomy and detailed. The maximum number of players per map is 16. 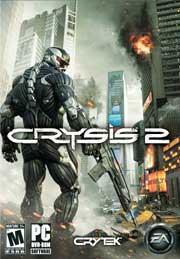 While I thoroughly enjoyed the single player campaign I can’t recommend Crysis 2 for everyone. The violence is pretty intense and there’s a lot of human and alien blood splattered as you’re pumping lead into them. Violence is to be expected in a first person shooter but these days foul language is bundled in as well. I’m not talking about random taunts here and there either. Every swear word I can think of is used in this game repeatedly and the Lord’s name is thrown in for good measure too. Those are my biggest complaints and they’re substantial ones. On a positive note, there’s no sexual or supernatural content anywhere. The graphics are stunning and the city environment is believable. I haven’t been to New York so I can’t vouch for how accurate the maps are. While I like the city settings, I must say that this entry into the franchise isn't as “open” as the jungle-based predecessors. Yes, you get rewarded for exploring a little but there are a lot of locked doors that guide you on a rather narrow path. The music blends into the game very well. When the battles get intense the music sets the mood and keeps your adrenaline pumping. The voice acting is spot-on and is mostly getting fed to you via suit transmissions. However in battle you’ll hear soldiers talking and taunting the aliens calling them Squids and so on. With the excellent story, audio and visuals Crysis 2 is quite a fun ride. There is multiplayer but without LAN support or the ability to set up my own server I won’t be playing it. I don’t have the urge to play through the single-player campaign again and quite frankly would rather play a game where it’s safe for my kids to be within ear shot of it. I really didn’t like the extreme swearing and wish there was a way to disable it.